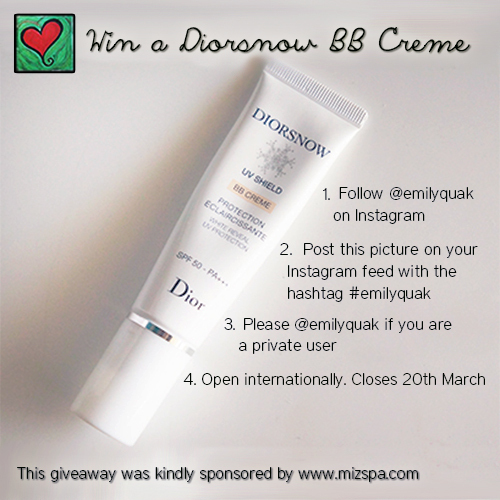 Dior Diorsnow UV Shield BB Creme Giveaway! Hello, everyone! I just wanted to come on here quickly and post this giveaway, kindly sponsored by mizspa.com. All you have to do is hop on to my Instagram page, follow me, and post this photo in your photo stream with the hashtag #emilyquak (or tag @emilyquak if you're private!). And please, please hop on over to our kind sponsor's Facebook page and 'Like' it! They are a fabulous online website that sells beauty products, and they ship worldwide.